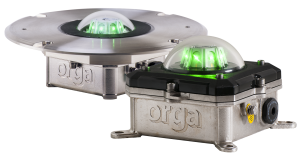 For offshore helicopter landing areas, Orga offers a range of perimeter lights configured in green, yellow and blue. By providing good colour contrast throughout approach and landing at night and in poor visibility conditions, these lights will help the pilot see the helideck on your offshore installation. Additionally, recessed versions of the green perimeter lights are available. These are used to mark and illuminate the inboard edge of the landing area where there is a need to move a helicopter or large equipment off the helicopter deck. Why do you need helideck perimeter lighting? Orga’s helideck perimeter lights meet the applicable regulatory requirements laid out in IALA, IMO and the UK Civil Aviation Authority’s (CAA) CAP437. With respect to the latter, compliance with CAP437 specifically calls for, among other aspects, the use of perimeter lighting. 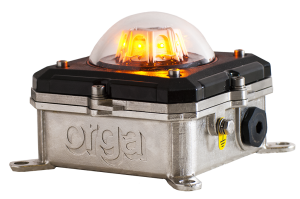 To cover all your requirements, Orga’s heliport perimeter light products, which are part of our L85EX series, are available in yellow, green and blue. AC and DC versions are available of all versions including the recessed green perimeter lights. As is designated by the “EX” in the product name, all our green, yellow and blue helipad lights are explosion proof and certified for use in zone 1 areas where there is an increased gas explosion hazard. Why choose Orga’s heliport perimeter lighting? The advantages of using our perimeter lights are as clear as the area they are designed to mark out. Thanks to the use of the very latest LED technology and materials, they have low power consumption, a long lamp life of up to 100,000 hours, robust corrosion resistant stainless steel fittings and an impact-resistant dome. Furthermore, they offer high reliability, low cost of ownership, easy serviceability and the interchangeability of parts. Finally, their compact design means they meet the maximum 150mm height restriction imposed by IMO.